Tuberculosis (TB) remains an enormous public health concern globally. India and South Africa rank among the top 10 high TB burden countries with the highest absolute burden of TB, and the second highest rate of TB incidence, respectively. Although the primary drivers of TB transmission vary considerably between these two countries, they do indeed share common themes. In 2017, only 64% of the global estimated incident cases of TB were reported, the remaining 36% of ‘missing’ cases were either undiagnosed, untreated or unreported. These ‘missing TB cases’ have generated much hype for the challenges they present in achieving the End TB Strategy. Although India and South Africa have indeed made significant strides in TB control, analysis of the patient cascade of care clearly suggests that these ‘missed’ patients are not really missing—most are actively engaging the health system—the system, however, is failing to appropriately manage them. In short, quality of TB care is suboptimal and must urgently be addressed, merely focusing on coverage of TB services is no longer sufficient. While the world awaits revolutionary vaccines, drugs and diagnostics, programmatic data indicate that much can be done to accelerate the decline of TB. In this perspective, we compare and contrast these two national epidemics, and explore barriers, with a particular focus on the role of health systems in finding the missing millions. In 2017, only 64% of the global estimated incident cases of tuberculosis (TB) were reported worldwide, the remaining 36% of ‘missing’ cases were either undiagnosed, untreated or unreported. Analysis of the patient cascade of care in India and South Africa suggests that these ‘missed’ patients are not really missing; most are actively engaging the health system (public and private) but not adequately managed. National TB control programmes need to identify gaps and weaknesses along the entire patient care cascade, addressing barriers to appropriate diagnosis, linkages to treatment postdiagnosis while strengthening both public and private healthcare sectors, and bridging the gap between provider knowledge and practice. Integration of TB services within universal health coverage is critical for identifying and managing missing patients with TB. India and South Africa rank among the top 10 high TB burden countries. With 2.7 million new cases in 2018, India has the highest absolute burden of TB.1 With 567 new cases per 100 000 population, South Africa has the second highest rate of TB incidence.1 Despite these top ranks, and collectively accounting for 31% of the world’s burden of TB, and 37% of TB deaths,1 the nature of the epidemic in South Africa and India is considerably different (table 1). In this perspective, we compare and contrast these two national epidemics, and explore barriers, with a particular focus on the role of health systems in finding the missing millions. The cascade of care for all forms of tuberculosis (TB) in India’s Revised National TB Control Program (RNTCP), 2013. Error bars depict 95% CIs (Adapted from Subbaraman et al 11). Recent standardised patient studies, covering four Indian cities, provide additional insights on how Indian private pharmacies manage patients with suspected or known TB.14 15 Correct management of the simulated patients ranged from 13% to 62%, increasing with the certainty of the TB diagnosis. Antibiotics were frequently dispensed over the counter to simulated patients, with 16%–37% receiving such drugs across the cases. On a positive note, these studies showed that no pharmacy dispensed first-line anti-TB drugs. A common thread across all the simulated patient studies of TB in India is the low rates of TB testing by a variety of private providers, even when patients present with textbook description of suspected TB. Instead, empirical, broad-spectrum antibiotic and non-specific therapies was the norm. Thus, even when patients seek care, they get missed, or have a delayed diagnosis. The cascade of care for all forms of tuberculosis in South Africa, 2013. Error bars depict 95% CIs (Adapted from Naidoo et al 18). A recent simulated patient study from South African primary health clinics in two provinces showed that only 43% of interactions resulted in simulated patients receiving a TB sputum test and being offered an HIV test. 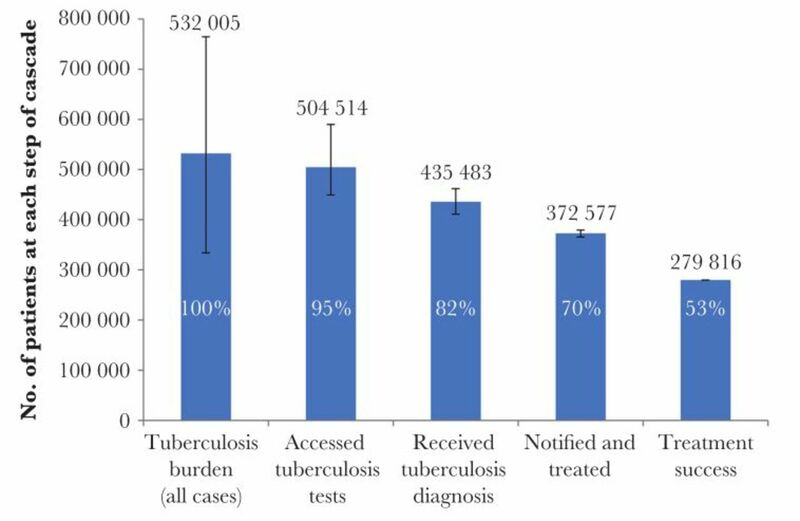 TB sputum tests were conducted routinely (84%) while HIV tests were offered less frequently (47%).26 The 11 country-patient pathways analysis shows that nearly one-third of South Africans seek initial care outside the public system. Private providers are less likely to order a sputum test and patients accessing private care experience longer diagnostic delays.6 27–31 The findings of these studies reveal the magnitude of missed opportunities in the patient cascade of care that may be fuelling disease transmission. Forty years after Alma-Ata, nearly half the world’s population lacks access to essential health services. To address this crisis, countries must commit to universal health coverage (UHC).43 A strong primary healthcare system is the backbone of UHC. However, as reviewed earlier, TB is often missed by primary care providers in both public and private sectors. So, a big challenge for the TB field is the need to rethink the traditional vertical TB care delivery model, and integrate TB care within UHC. While the vertical approach has been helpful in ensuring donor funding and technical expertise, the model’s limitation has been exposed by the fact that nearly 40% of patients with TB are missing in the DOTS system. TB control programme monitoring must go beyond the traditional measures of success such as effective treatment. NTPs need to identify gaps and weaknesses along the entire patient care cascade and using the science of QI to address barriers to appropriate diagnosis and linkages to treatment postdiagnosis.17 Indeed, ending the TB epidemic will require rapid scientific advances: innovative diagnostic tools, new drugs and an effective TB vaccine. However, while the world awaits these revolutionary developments, programmatic data indicate that much can be done to accelerate the decline of TB by strengthening health systems and improving quality of care.
. Global tuberculosis report 2018. Geneva: World Health Organization, 2018.
. Global tuberculosis report 2017. Geneva: World Health Organization, 2017.
. Fixing the broken bones of India's health system: al Jazeera America, 2015. Available: http://america.aljazeera.com/opinions/2015/9/fixing-the-broken-bones-of-indias-health-system.html [Accessed 11 Jul 2018].
. South Africa HIV country profile, 2016. Available: http://www.who.int/hiv/data/Country_profile_South_Africa.pdf?ua=1 [Accessed 15 Nov 2018].
. In: Massyn N , Peer N , English R , eds. District health barometer 2015/16. Durban: Health Systems Trust, 2016.
. Global tuberculosis report 2016. Geneva: World Health Organization, 2016.
. Confusion, caring and tuberculosis diagnostic delay in Cape Town, South Africa. Int J Tuberc Lung Dis 2010;14:171–80.
. Public–private mix for TB prevention and care: a roadmap. Geneva: World Health Organization, 2018.
. National strategic plan for tuberculosis elimination 2017–2025. New Delhi: Ministry of Health with Family Welfare, 2017. South Africa's national strategic plan for HIV, Tb and STIs 2017-2022. Available: http://sanac.org.za/wp-content/uploads/2017/05/NSP_FullDocument_FINAL.pdf[Accessed 11 Jul 2018].
. 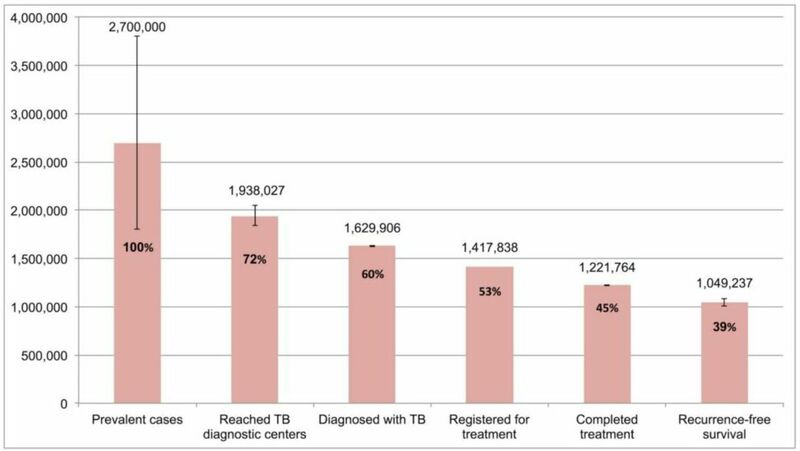 The Science of Improvement: TB Cannot Afford to Lag Behind, 2018. Available: https://naturemicrobiologycommunity.nature.com/users/20892-madhukar-pai/posts/32859-science-of-improvement-tb-cannot-afford-to-lag-behind[Accessed 11 Jul 2018].
. Engaging private health care providers in TB care and prevention: A landscape analysis. Geneva: World Health Organization, 2018.
. National health insurance for South Africa - Towards Universal health coverage. Republic of South Africa: National Department of Health, 2015.
, 2016. Author. Available: http://www.who.int/tb/country/data/download/en/ [Accessed 11 Jul 2018].
. General Household Survey, 2017. Pretoria: Statistics South Africa, 2017. Contributors All authors contributed equally to the writing of this manuscript. Funding This work was supported by the South African Medical Research Council. NP, NN and KN are supported by the Centre for the AIDS Programme of Research in South Africa (CAPRISA). AD is supported by a salary award from Fonds de recherche du Québec–Santé (FRQS). MP is supported by a Canada Research Chair award.